Most people have a winter sport that they enjoy, like skiing, snowmobiling, and snowshoeing. Here at the rabbitry we have water-crock thawing. Taking the hard water out and putting the liquid water in. This is something that you have to deal with when raising rabbits in a cold climate. 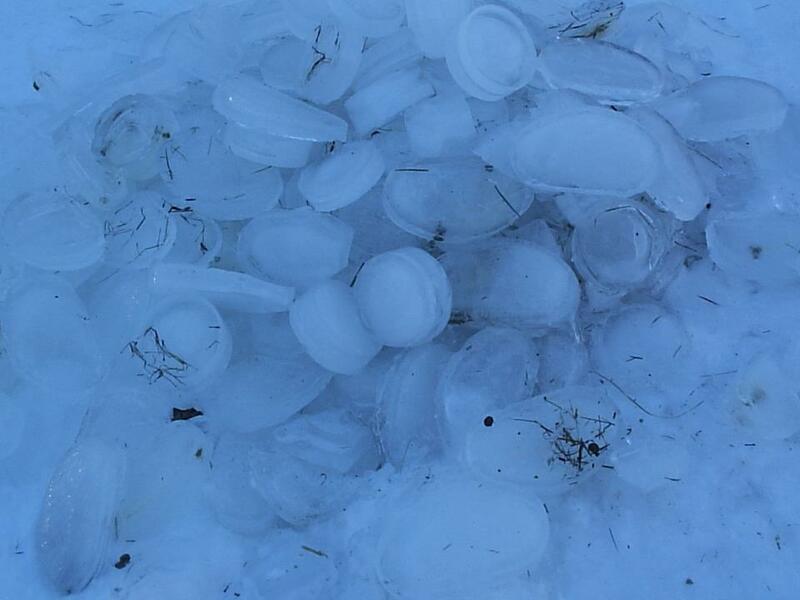 The picture on this post was the beginning of the ice crock pile of 2013! The hardest part of raising rabbits in the winter is keeping them watered. As long as you give them fresh water twice a day, they will do fine. I use water bottles most of the time except in the winter. This is when I switch over to metal crocks (metal does not crack due to the expanding ice and thaws easy). It takes me less than a 5 gallon bucket of hot water to thaw all of my crocks. I drop a few crocks in the hot water and the ice pops out, I put the ice in a separate bucket to make the hot water last longer. I wear dishwashing gloves and my hands stay warm and dry. If my rubber gloved hands do get cold, by putting them in the warm water they warm up quick. By putting the ice in a bucket I keep the extra moisture out of the rabbitry. I will dump the removed ice blocks were I want the extra water in the spring thaw. I have a method to my crock watering in the winter. I only have to unthaw my crocks fully, once a day usually at night. After de-icing in the evening, I fill the crock 1/2 full they will drink their fill before it freezes. In the AM I fill the crocks to the top (at this time there is a small layer of ice on the bottom of the crock left from the evening water) and again they drink their fill. Later in the day my wife makes her rounds with hay topping off the crocks again. Then the process starts again in the evening as I de ice and water again. I like this method and works great for me. Some people use hammers to smash the ice out of the crocks (technically know as clunking), or just have lots of spare crocks bringing the frozen ones into the house or basement to thaw. We can loose power here in the winter, sometime for as long as a week. During this time I can still heat water to thaw my crocks with propane or wood. I have also thawed the metal crocks with a small propane torch, by heating up the bowls bottom and side slightly the ice falls right out. I am not a big fan of the auto watering setup I have used these in the past and even in good weather had issues with them not working properly. You do not know how much each rabbit is drinking this helps you to observe and know if a rabbit is “off”. There are many breeders who love this setup, I am just not one of them. They now also have the ability to keep fresh water to your rabbits all year round. Bass equipment sells a couple different systems to freeze proof a watering system. One has a bucket with heater and circulating pump or heat cables to run through pipes in an auto watering set up. Heated auto water setup I have even seen some homemade setups that do work in the winter. There are some breeders I know in Alaska, they run their rabbits in a colony setting for the colder months and use a regular large metal chicken waterer with a base heater and this has worked for them just fine. In the spring they return their rabbits to the hutches and cages. I have heard that by adding two or three drops of glycerin into the rabbit’s water bottle. This sweet syrup will prevent the water from freezing as fast. Medical glycerin can be purchased from a pharmacist while vegetable glycerin can usually be purchased from a grocery store’s baking department. Just make sure you rabbit continues to drink the water with this added flavor included. I have never tried this method, if anyone has I would love to hear the results. I do not like the added sugar to their diet I would rather take the time to thaw my crocks. JOIN THE RABBIT REVOLUTION! like us on face book, subscribe to the web page to get new information as it is posted. Raising Meat Rabbits To Save The World! WHAT BREED OF RABBIT TO RAISE FOR MEAT? The 2018 Comfrey season has begun!